Just Listed :: Amazing Midtown Townhome! Welcome home! 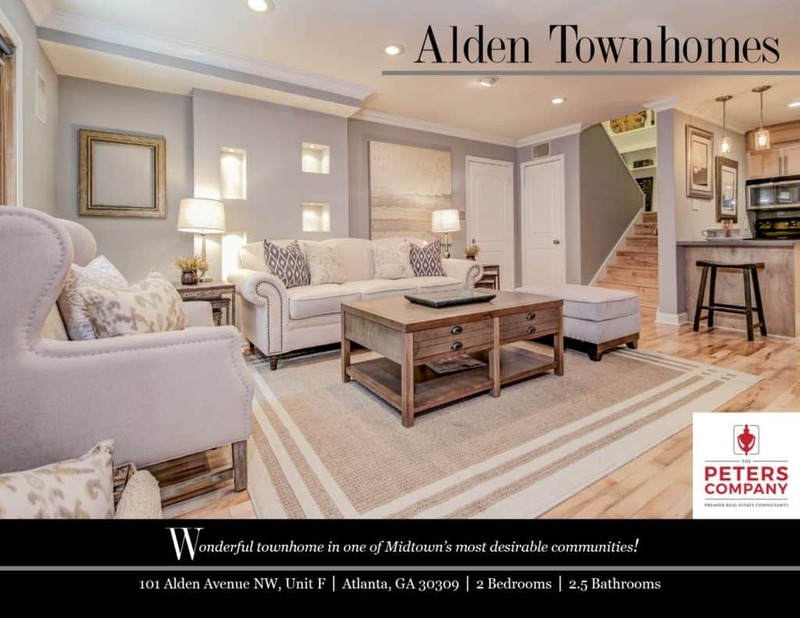 This updated townhome in Midtown’s highly sought after Alden Townhomes community is just what you’ve been looking for. Its open floor plan, custom features, and modern flair will never go out of style. Convenient to Midtown’s finest attractions, you will be in the middle of it all including prestigious shopping, award-winning restaurants, and exciting nightlife. Easy access to Peachtree Road, I-85, I-75, and GA400 will make virtually all commutes a breeze. · Kitchen features stainless steel appliances, sleek backsplash, stone countertops, ample cabinet space, and island with breakfast bar. · The main living space includes a nice combination of living and dining area which are perfect for entertaining. It’s accented by a gas fireplace with stacked stone surround. · Gleaming hardwood floors are carried throughout both levels of the townhome. · Main level half bathroom is ideal for guests. · The master bedroom boasts a spacious walk-in closet and access to the deck which is perfect for outdoor enjoyment. · The spa-like master bathroom features a double vanity with vessel sinks, jetted tub, and separate jetted shower system. · Additional bedroom is well-sized and bright. · A second floor bonus space is ideal for a home office or media room. · One car garage easily fits your vehicle with additional storage space. ← Just Listed :: Move-In Ready Condo in Hillside at Lenox!